You are here: Home / Live Pain Free / Is Magnesium Deficiency Causing Your Muscle Cramps? Are you being woken up at night often with muscle cramps in your legs? Or perhaps you get a sudden cramp walking and it stops you in your tracks? Magnesium deficiency is a common nutritional deficiency which can cause muscle cramps. I get a lot of questions from my patients about why they are getting random muscle cramps in their legs. It disturbs their sleep and can become an annoyance. Muscle cramping has a number of causes. Magnesium deficiency would be one of the major causes you would consider. Bone health. Magnesium works with vitamin D and vitamin K2 to balance calcium levels. Energy production. A deficiency in magnesium can cause fatigue. Magnesium plays an important role in controlling muscle contraction. If you have low levels of magnesium, muscles will contract or tighten up. (1) This can result in muscle cramps. Magnesium deficiency is very common, at least in Canada, the U.S., and likely other industrialized countries. Eating food high in magnesium as well as supplementing with magnesium can be important in solving muscle cramps. Why is magnesium deficiency common? There are a number of reasons many people are deficient in magnesium. In part, there is some proof soil has been depleted of magnesium. As well, people aren’t eating a diversity of wild plants that our ancestors used to eat. The cultivated plants we eat today have less magnesium in them. There is a lack of magnesium intake in our diets. Most people in the modern industrialized world are eating too many processed foods which are low in magnesium. Even people that eat a nutrient dense diet like the Paleo diet may not reach the recommended daily intake (RDA) of magnesium. Anti-nutrients, such as phytates, are present in many foods that contain higher levels of magnesium (nuts, seeds, dark leafy greens, and legumes). Phytates decrease the absorption of magnesium. People taking PPIs (proton pump inhibitor drugs) for heartburn/GERD. If you are taking PPIs, make sure you aware that you won’t be able to digest and absorb nutrients from food as well. If you have diabetes, kidney problems, you’re an alcoholic or are taking diuretic drugs, you will excrete more magnesium because of increased urination. Even if you are aware of how to get magnesium from food and supplements, you may not be getting enough. The RDA for adult men is 420mg/day and 320mg/day for adult women. Keep in mind the RDA is the value needed to prevent acute deficiencies. For optimal ranges (to keep your body and mind functioning well), you should be getting 500-700mg/day from a combination of food and supplements. Include nuts and seeds in your diet. Pumpkin seeds and almonds are examples that are higher in magnesium. However, nuts and seeds have phytates in them meaning that you’re not going to absorb all of the magnesium in those foods. Your could the soak nuts and seeds overnight and then dry them before consuming them. The soaking breaks down the phytic acid and allows for better absorption. Other foods high in magnesium include dark leafy greens (spinach and chard), molasses, dark chocolate, and bananas. Dark chocolate might be one of the easiest foods to consume to get magnesium without any preparation. YAY! The process of making chocolate breaks down some of the phytic acid. Legumes are also a good source of magnesium if you can tolerate them. However, because of the phytic acid in legumes, they need to be soaked so magnesium is easier to absorb from them. As mentioned, about 50% of Canadians are deficient in magnesium (based on RDA ranges). The average American gets less than 250mg/day of magnesium from food which is well below RDA ranges. You are going to need to supplement with magnesium to get to the optimal ranges of 500 – 700mg/day. If you’re eating a nutrient dense diet like the Paleo diet and you’re getting a wide diversity of plants in your diet, and you are soaking seeds and nuts, you may only need to supplement with about 200mg/day. If you’re eating a nutrient dense diet like the Paleo diet and you don’t feel like you’re eating a wide diversity of plants, and you’re not soaking seeds and nuts, then I would suggest you start at 400mg/day. If you’re not eating a nutrient dense diet like the Paleo diet you may want to supplement higher than 400mg/day and even up to 800mg/day. The dose of up to 800mg/day would not be expected to cause any toxic symptoms. However, I would build up to that dose gradually. A sign of too much magnesium would be loose stools. Chelated forms of magnesium like magnesium glycinate and malate tend to absorb better. Magnesium glycinate also tends to be good for chronic pain and muscle contraction. So I would recommend this form of magnesium for you to see if it helps with your muscle cramps. 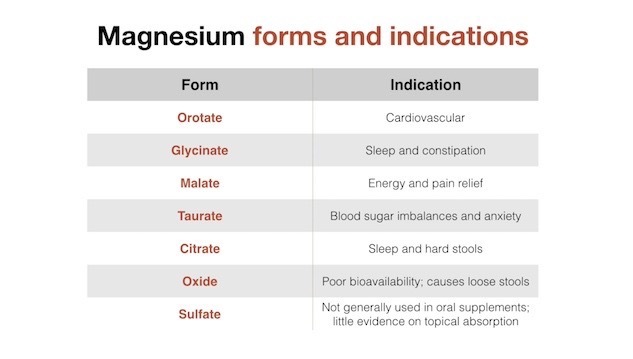 I have also included a table below for you to look at regarding the different uses for different types of magnesium supplements. Speaking of absorption, magnesium absorbs better when taken with protein in your meal. I like taking my whole daily dose of magnesium glycinate with my evening dinner as I find it helps me sleep better. Magnesium is a vital mineral your body needs for many functions including nerve signals and muscle contractions. Magnesium deficiency is very common and one of the symptoms is muscle cramps. Even if you eat really well, it’s hard to get optimal amounts of magnesium. Therefore, supplementing with magnesium whether or not you have muscle cramps is important. If you do have muscle cramps, supplementing with 400-800mg/day of magnesium is certainly worth a try. I have very painful nocturnal foot/leg cramps that used to be sporadic, but now occur nightly. As a result, I am getting inadequate rest and my quality of life is affected. A friend recommended Cramp Defense, containing magnesium malate, but the cramps persist. I am 71 years old, not diabetic, have good kidney function and my electrolytes are in the normal range. I do have PAD in my left leg, but the cramps occur in both feet/legs. I most likely have poor circulation. Do you suggest I try magnesium glycinate instead and if so, how many milligrams? Is there anything else you can recommend? I’m at my wits end. Thank you. You certainly could try Magnesium Glycinate for a month to see if that would help. Experiment with 400-800mg in the evening with dinner. You are certainly correct that poor blood flow can cause cramping. The other thing I see in my practice with patients with night cramps is inadequate nerve signalling from the spine to the brain and back to the muscle. Spinal misalignments and loss of mobility can disrupt the brain-muscle connection. Consider seeing a chiropractor to that does thorough assessment of your spine to see if they can help. 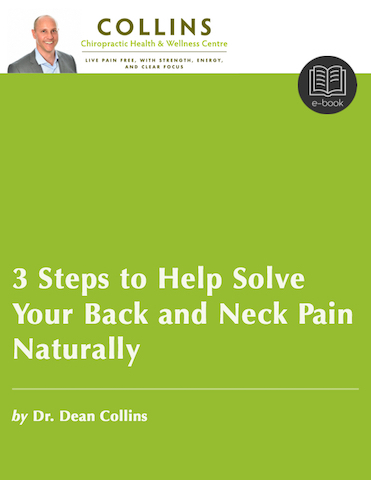 Adjustment to the spine help to reconnect the brain and nerve signals to the muscle. The other thing to consider is you may not be absorbing magnesium and other important minerals properly. People with gut problems like IBS and/or heartburn have underlying problems that lead to nutrient deficiencies. So another consideration is seeking out a functional medicine practitioner or naturopath that does a through assessment of the gut. I get stomache spasms sometimes severe on both sides of my abdomen. I was told that magnesium would help with that. Is that true? You are asking if magnesium would help with stomach cramps. Possibly. Regardless, magnesium is one of these minerals that I would recommend people take as it is hard to get from food. So I would try a good quality magnesium supplement as indicated in the article. Failing that, I would seek professional advice from a functional medicine practitioner or naturopath to determine the underlying cause of your digestive distress. I am 32 weeks pregnant and have been waking up 2-3 times a week for the last 3 weeks with the worst leg cramps/muscle spasms I have ever had in my life. I’ve also had pretty bad heartburn and have been taking prescription medicine for that as well as OTC. Do you think magnesium would help? Thanks for your inquiry. Magnesium certainly could help with muscle cramps and it won’t hurt you or your baby to try. Magnesium is one of those supplements most people should be taking anyway. Try starting with 400mg with your evening meal. I don’t know whether you struggle with constipation , but magnesium can also help with that. Can extreme leg pain from a person who has Parkinson’s be helped with magnesium supplements and if so what kind? Thanks for your inquiry. The extreme leg pain could be a number of things, but magnesium deficiency could be one of the causes. As you read in the article, magnesium is one of those minerals that is hard to get from food. So regardless of whether some one has Parkinson’s or not, people should probably supplement with it. Magnesium glycinate or malate are good absorbable forms. If the person with Parkinson’s has constipation they can try magnesium citrate. As a side note, if you haven’t already, you might want to look into the ketogenic diet for treating Parkinson’s as well as investigating potential gut infections like Small Intestine bacterial Overgrowth. Regular chiropractic care can also be utilized to improve mobility and brain function. My husband has been having nighttime leg muscle cramping through four marriage of 21 years. However he uses to only have them very rarely (maybe once a year) . He has been taking magnesium / calcium supplements religiously as he found not taking magnesium seems to slow them down. However they are becoming more frequent and more severe. These have always been the type of cramp to wake us out a dead sleep, and he screams and they last several minutes. One night he had 3 back to back and he couldn’t even walk on it for 2 days. The leg in question has a severe knot or it always feels flexed- 24/7 since the incident. He’s just had another one tonight and I’m concerned. Is the fact that themuscle flexing that doesn’t stop, cause for concern or indicate any possible cause of these persistent painful cramps?? You are asking if your husband’s cramping is a cause of concern. I would be concerned because it’s not normal and it could get worse the longer you leave it. Without a thorough history and testing it’s hard for me to say what the cause may be. I will offer you a few suggestions. I sometimes see abnormal muscle cramping because a patient’s brain is misfiring nerve signals to the muscle. Adjusting the spine (chiropractic care) to improve spinal alignment and mobility helps regulate/optimize brain and nerve function. We often find cramping can go away after 1-3 months of regular chiropractic care. So I would schedule him in to see a chiropractor that you are comfortable and confident in and get thorough history and examination done. I have been getting leg cramps at night off and on for several years now. Recently they have been more frequent and more intense. I have tried Theraworx,which is magnesium sulfate spray and helped for about 2 weeks and then cramps came back. Any other suggestions would be helpful. I do talk a supplement of about 300 mg. a day. You can try bumping up your oral dose of Magnesium to 400-800 mg/day with your evening meal. Try Magnesium glycinate or malate as they tend to absorb better. Sometimes people don’t absorb nutrients well even if they take a supplement. Getting your gut assessed thoroughly might be warranted. You can read some of my other articles about that. Cramping in legs can also be related to nerve signal interference from the spine being out of alignment. So another option is for you go get your spine and nervous system assessed thoroughly by a chiropractor you trust. I wish to address a few issues; is there one product I can take , or do I need three? Threonate seems a match for mental function and memory, but must I also buy a second type for cramps? Stress? Or is there an all-in-one? PS My bloodwork says I’m not Mg deficient, but im wonder if I might still benefit from supplementation. Magnesium in the blood is not a good measurement to determine deficiency. It only accounts for 1% of the total magnesium in the body. Rather, deficiency seems to be based on consumption in the US and Canada that is well below recommended intake. As well, they the soil has largely been depleted of magnesium and that our consumption of wild plants is limited. For these reasons, it is one of those minerals that I would recommend people take in supplement form to ensure they are getting enough. So I would experiment supplementing with magnesium for your issues. As far as your anxiety and memory. There are many causes for these types of problems: perceived stress, food intolerances, gut infections, blood sugar imbalances, inflammation, poor sleep, high or imbalanced cortisol levels (adrenals), environmental toxins, etc. There are so many supplements that support each of these causes, but the bottom line is you can’t supplement yourself to health. Here are some common supplements: B vitamins (B6 and B12 in particular), vitamin D, probiotics and prebiotics, magnesium, herbs that support the adrenal gland, supplements for sleep if that’s an issue. Sorry I couldn’t give you an exact answer but if anxiety is a huge issue it requires special investigation and testing which then leads to a more focussed treatment.